One of the world's top scuba diving destinations, the islands of the Bahamas offer scuba divers of all skill levels with seemingly unlimited options of scuba diving destinations. The Ocean Wall dive is one of those many destinations, and certainly one of the more unique and impressive. The Ocean Wall & Reef Dive takes a few lucky divers out to the "Tongue of the Ocean," an underwater wall that starts at about 60 feet of depths, with a gentle and subtle slope to about 80 feet, followed by a sudden drop that goes to over 500 feet in depth! Seeing this drop is something that is truly awe-inspiring and almost frightening but extremely beautiful. The wall is the ideal habitat for a wide assortment of marine species including large predatory fish that you do not get to see at just any regular reef site! Keep your eyes peeled as you never know when you might catch a sighting of large grouper, grunts, snapper, lobster, eel, and many of the other “regulars” who make their home in or close to the wall. After diving at the wall, our second dive takes you to one of the area's gorgeous coral reef destinations. The Bahamas are surrounded by some of the Atlantic's best coral reef sites for scuba diving, so going to one of these sites is almost a requirement for scuba divers visiting the area. Please note that our Bahamas Ocean Wall & Reef Dive departs out of Nassau and usually only goes out once a week, so call us to check the most up-to-date schedule! Complimentary pick up is provided from all hotels. Yes. 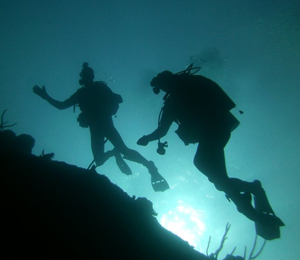 While your partner will not be able to participate in the dive itself they can come along as a bubble watcher (rider) and enjoy the trip with you. Do you have nitrox tanks available for use? No for this particular dive we do not have nitrox tanks available. I have been to the Bahamas many times, but Bahamas Ocean Wall & Reef Dive is one of my favorite trips! It includes everything that everyone should do here. As a Bahamas veteran, I can say only the best about this experience!